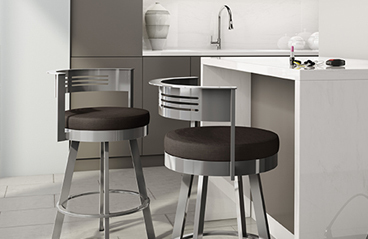 Bar stools can be divided into two groups, custom or “off the rack”. With custom stools, you specify one or more aspects of the stool’s design in your order, and then it’s built especially for you. Usually you can request a particular seat height, seat type, upholstery, arms and more. Last much longer because they tend to have fully welded frames. Have the best quality fabrics and vinyls. Protect your floors better with nylon caps on the bottoms of the feet. You can also add felt pads for extra protection. Save you money in the long run because they last so much longer than “off the rack” stools from big-box stores. Are easier to put together because they have welded frames, not screwed. You simply connect the seat to the base (the legs part) with four screws. So simple, and it saves you so much time and frustration. Reupholster the stool if you want to change the seat color. Simply, unscrew the four bolts underneath the seat and the seat pad will come off. We recently reupholstered one of our kitchen stools. It was quick, easy, and made the stool look fresh. Buy a new base that’s taller or shorter if you move to a new home with a different counter height. It’s better than throwing away a beloved stool. If you have any questions about how to customize your stool for your home and lifestyle, let us know or call us at 610-737-5693! We’re happy to help you choose stools that you’ll love for years to come.